Heartfelt thanks to all who have contributed to Access Press in recent weeks and months. Donations large and small have come in after the newspaper board, and staff outlined the financial pressures we were facing. We are thankful for all of you and have enjoyed the notes from people who rely on Minnesota’s disability news resource. You have each made a huge, positive difference. We also appreciated the work of the Minnesota Organization for Habilitation and Rehabilitation or MOHR, and John Wayne Barker of Merrick Inc. for initiating the $10,000 challenge to its members to support Access Press challenge of the MOHR to pledge of donations to meet the Access Press’s immediate financial needs. We immensely humbled by the support of this essential statewide organization. Handi Medical came across with a $5,000 donation which was also a huge blessing and with this we can continue moving forward. A big thank you also goes to UCare foundation, which has approved a generous grant to the newspaper. This funding in part helps us set the future direction for Access Press. These gifts and much other help us continue to bring you the news of Minnesota’s disability community and help us plan for the future ahead. While we continue to seek supporters, advertisers, and subscribers, our situation is not as bleak as we once feared. These donations and many others have helped us recognize our need to be a sound informational source for the disability community. We can’t thank all these folks and the many individual donations that have come in. We are truly thankful! Thank you! If a group is considering seeking contributions for Access Press, donation envelopes are available for your event or gathering. The award pays tribute to an individual who serves the state’s disability community. People from a wide range of backgrounds and sectors of the disability community have won the award in the past. The banquet is a unique event for Minnesotans with a wide range of disabilities enjoy attending and celebrating community accomplishments with us. Typically, in June the nominees are sought for a November award presentation. Earlier this year the newspaper board decided to cancel the annual award banquet, in light of the newspaper’s financial circumstances. The award nomination and review process are very rewarding for our staff and board, but both take time. The banquet itself is always delightful, but it also takes a great deal of staff and volunteer time, as well as resources. 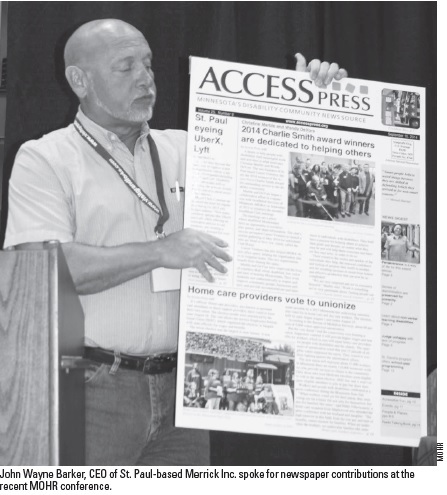 Access Press Charlie Smith award and next steps.